Bob Walkenhorst doesn’t draw the fans he used to. This applies to both quantity and exuberance. His crowd is much older now and his audience reflects that. The decent sized crowd in Maryville, MO on 8/16/12 to see Walkenhorst and Jeff Porter were mostly older and many had their children with them. I’m sure many trying to convince their kids how “cool” Walkenhorst was in his 80s/90s band The Rainmakers. He used to jump around a lot and were all colors of the rainbow even donning a top hat before Slash made it cool. Now Walkenhorst took the stage in grey slacks and a white button up shirt. The most colorful part of his wardrobe these days is his grey hair. His writing/performing partner Jeff Porter is much the same. Porter now lets his hair grow long and lets the silver lochs shine in the sun as well. Their hair that showed their age so well was highlighted by the fact that the outdoor show had a stiff breeze to keep the hair moving. The show shut down the main street of Maryville and was right in front of the courthouse. It made for a very cool backdrop for a show but still seemed unnecessary for the size of the show. Maryville is notorious for being a little too willing to shut down the streets of the square so it came as no surprise. 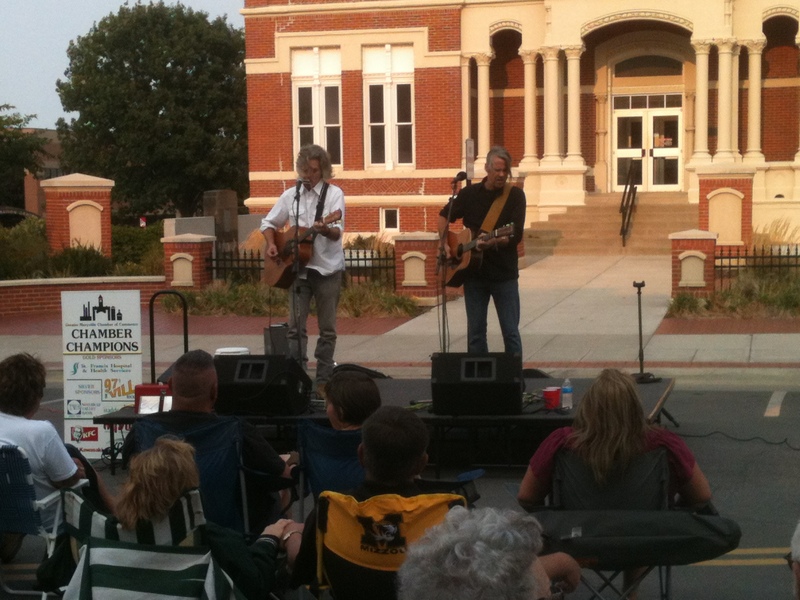 Bob Walkenhorst and Jeff Porter perform live in the street of Maryville, MO in front of the courthouse on 8/16/12. The 25 songs delivered on the night by the two would fit the family environment very well. It would be a mix of a couple covers and several slower songs and it would never get too rowdy. Possibly the Rainmakers most known song “Downstream” was performed right away but it would be one of only a few well known songs originally by the band. Porter, who is now a member of The Rainmakers, would help Walkenhorst bust out 6 songs from the band’s latest album 25 On. It was nice to see songs like “Half A Horse A Peice” “Kansas City Times” and “Go Down Swingin” get performed off of that album. Porter really compliments Walkenhorst well. While Walkenhorst excells at hitting the upbeat rockers, like the classic “Downstream”, Porter seems to hit the soft notes better. Porter’s songs “She Still Waits” and “Savannah” off of his solo album 15 Miles hit a heart string that Walkenhorst can’t seem to get to as well. Porter’s “Little Bit Of White Trash” got one of the best responses of the night as it profiles people that everyone seems to have in their life. Really the show was stolen by Porter however, singing only about 6 of the 25 songs he enduced great responses from the crowd and ultimately showed his songwriting is on par with Walkenhorst. This entry was posted in Concert Review and tagged 15 Miles, 25 On, 8/16/12, Bob Walkenhorst, concert review, Downstream, Jeff Porter, Maryville, Missouri, MO, The Rainmakers. Bookmark the permalink. You need to go to a Rainmakers show before you judge the Exuberance of the crowds that come to see Bob Walkenhorst. Trust me, there’s no lack of exurberance from crowds at their shows. Don’t compare an acoustic show to a Rainmakers show. They aren’t the same, and don’t get the same kind of crowd response. If you aren’t seeing the kind of crowd reaction that the Rainmakers used to get, well, you aren’t at a Rainmakers show. Go to a Rainmakers show and then judge. I appreciate your review. I like being able to read about a show I wasn’t at. I just think that particular comment was unfair, because it’s comparing two different things as if they are the same. Thanks for the feedback Ellen. I realize that Bob and Jeff may not write together but in 2009 they did release an album together called No Abandon that I was alluding to. If you read the review I remark how different the shows were then as well. This show in Maryville was not a Rainmakers show nor did I ever hint that it was. Your words are still there, I can see them. What you claim you said isn’t what you said. You were comparing now versus then, not different types of shows. And you may have meant to allude to them doing an album together, but the fact still is, they’ve never written a song together, including on that album.